Update 2011: Sold to the LBS in trade for something new. Pictures soon. Update May 2009. This baby needs a tuneup, cables and tires, and I bought something new. If you are interested in buying this from me for $350 and are willing to pick it up in New London County Connecticut, contact me by email or facebook. Both contact methods can be found to the right below the "about me" section. Click on "contact the Umblogger." Here is my new bike review from April 2007, 2 years ago. I still think the Huffy Star-Spangler would be my ideal bike. 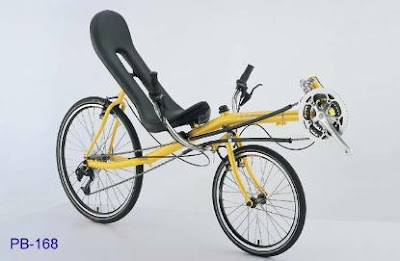 I bought a recumbent bike last month from Actionbent and have been using it for my commute. here is a picture of the Jet Stream 2, understeering. i've been a bicycle commuter for years but last summer i developed at work a bad case of tendinitis in both wrists which made riding painful. one day i longed for my old Huffy Star Spangler with the banana seat and the hot rod handle bars and pined for the good old days. then i remembered seeing kids on bikes that look like choppers. soon i was on the internet learning about bent bikes. there are many varieties on the theme out there. unfortunately, all my research was online because there were no shops around here selling them. i figured though, this style of bike was my only opportunity to resume riding. i read many bike forums. i read many websites. this website, the Bicycle Man, by a Christian bike shop owner is very helpful. turns out that bents are expensive. they are a niche product for people who aren't conventional. the kind of people who run barefoot, for example. that led me to ebay. when you search for bent bikes there you end up with alot of exercise machines. but finally i tuned my search to just road bents. i understood that understeering made the learning curve a little steeper to the bent experience. but i also thought it would be the least stressing on my wrists. understeering is indeed very comfortable now. even on ebay the bents were pricey except for some old bikes and some like the actionbents. this is what i ended up with. i didn't even try to put it together. i'm not up to sizing chain and running brake cable. my local bike shop owner was very helpful. it seems that my legs are shorter than the average actionbent buyer. so the tube needed a few inches cut off. but now i'm riding regularly. it has taken some getting used to. i'm still slow up the hills. i'm still slower to work. my knees did hurt in the beginning. with the pedals out front and a hard back to provide resistance it is easy to pedal harder than standing on the pedals. i still have some difficulty starting off balance. it is still a little wobbly. and one thing that i realized on the ride this morning. i wish i had extra money to get the bike with a suspension. my ride is bumpy. it's full of storm drains, potholes, frost heaves, etc. and although the seat is cushy, with the warmer weather and fewer layers i feel all those bumps in my back. it's kind of like a massage, but one you aren't ready for. i realized on my conventional bikes, i can stand on my pedals to go over the bumps and let my knees absorb the bumps, which isn't an option now. therefore, i like my ride, but next time i get a bike i'll get a bent with suspension. Thank you for taking the time to offer your review. I too am looking at purchasing my first "bent", mainly for its comfort aspect.I am also concerned about spending a lot of money. The Actionbent looks like a decent bicycle at a fair price. I am especially grateful for your comment concerning the bumps felt in your back while going over rough pavement, etc. I will definitely make sure the recumbent I purchase has this feature. you are welcome. i had a flat last week and had to ride my old bike. what a beast. i really like my bent. the only thing good about the old bike was the ease of climbing this really steep short rise. please see my other entires on biking, especially about wanting the cruzbike. it'll be my next bent. p.s. i'd appreciate it if you leave your name next time so i can address you properly. I bought a recumbent bike from Actionbent in April. This ended up being a truly horrible experience. Right now, I'm out over $1700 with nothing to show for it. I’m posting my story here hoping that others will think twice before buying a bike from Actionbent. I had to return the bike due to some issues with the dynamics. It’s been over six months since the bike got back to Actionbent, but I have not actually received a refund yet. I've given the owners (Randy Schulman and Steve Walther) every opportunity to make good on this. I sent multiple emails asking about the status of the refund, but I only got two responses. In August, they promised to send a refund within 2-3 weeks. That didn’t happen. In October, they finally processed a payment … but the check bounced! I’ve heard nothing from Randy and Steve since that point and am in the process of getting a credit agency involved. If you're considering buying from Actionbent, please think about supporting one of the many honest and decent recumbent distributors instead.